I've never really had any problems feeding my Lettie. She's a typical Dog, will eat anything, anywhere, any time. As long as it's food that is. She went through her Thyroid problem and is now on meds, 1/2 pill twice daily. Set the little half of a rice grain sized thing on top of the food and she'll just eat it as well as everything else in the bowl. Lately she's been sniffing at her food and taking all day to eat it. I was thinking that the next step was more blood tests, different pills, and hope for the best. I have been feeding her Purina One Lamb and Rice since I got her. With small exceptions like when I got a coupon on a different brand, she's almost never been off the stuff. It smells vaguely like mutton, and I guess to a Mc Nab Dog, it is heaven in a bowl. When I switched her off, well lets just say that I had to bring bigger bags to follow after her in a walk. Other foods weren't being "processed" as efficiently and she'd have more Poo to pick up after. We don't like that... back to the original food. 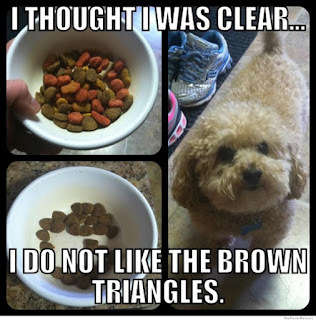 All that history, 10 years plus of it, is why I was surprised that she was acting like she didn't like the Brown Triangles. This picture started up right around when we were noticing she was getting fussy with her food. Laughing at the picture and seeing your Best Friend get fussy is distressing. Planning a trip to the Vet isn't that fun either. She loves a trip in the car, but immediately stresses when she gets to the Vet. It's not cause and effect, dog in car does not equal stress, but it's getting close. After a discussion we thought maybe it was a tooth problem. She is after all almost 12, and she does sometimes like to eat Ice. Don't do that, you'll crack a tooth like Mom would say. Noticing that she was eating the ice slower and "differently" I went into action. One cup dog food plus 2 ounces of water go into the dog bowl, microwave for 30 seconds. Now I'm not only making gourmet food for me and my own, but the dog is now included in that list. 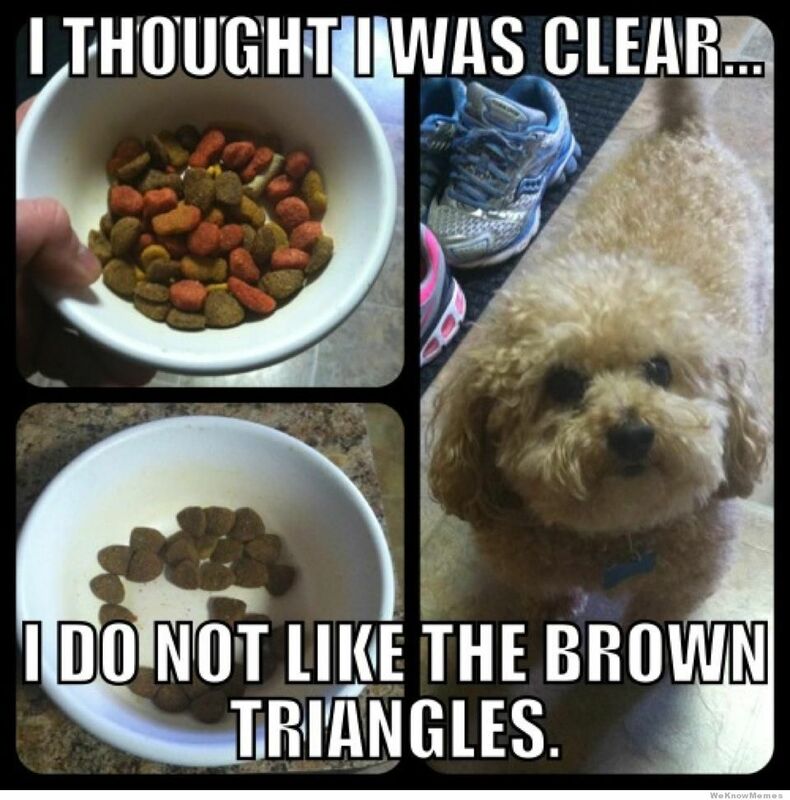 She gobbled that "new" food like it was going out of style. Since the Vet appointment is not for a few more days, we'll be watching her closely. After all, this sort of thing only happens on a Holiday.